After completing the survey, we watched a short video segment called “Grow Your Brain” from the episode Changing Your Mind (jump to 13:20) in the Scientific American Frontiers series from PBS. “You Can Grow Your Intelligence” (which I believe is the article Dweck had students read in her studies). “Flummoxed by Failure–Or Focused?” article from the Wall Street Journal which gives a brief summary of Dweck’s work. Infographic about Fixed vs. Growth Mindsets (although now I think I like the 2 page version here better). In a (sadly) mostly teacher-centered fashion, we read a few excerpts from the articles, pointed out the differences between the growth and fixed mindsets, and filled out the expert questionnaire. 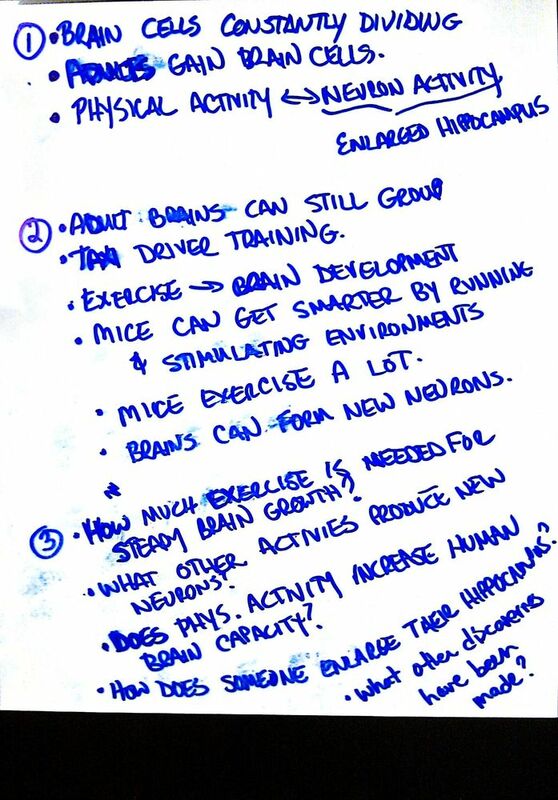 As I said previously, I think next year I’ll cut out the Mindset research stuff (which is separate from brain research shown in the Scientific American video we watched), and turn it into a lesson of its own. Now I just need to find a short video about Dweck’s research that I can share with students for that separate lesson. #4: The 10,000 Hour Rule/Being an Expert? Also, I need to give a shout out to John Burk, who inspired me when he started building a metacognition curriculum two years ago! What principles/concepts/ideas/research would you include in a Metacognition Curriculum? This entry was posted in Uncategorized and tagged metacognition. Bookmark the permalink. Cool! Thinking about their thinking is always awesome. Digging your survey questions too. Great stuff. Awesome! Here at Carleton we’ve been talking about how to encourage our students’ metacognition, but having students begin thinking about their thinking in high school is even better. Hi Frank, This line of teaching, to me, is more important than any science we’ll teach kids. I spent a lot of my time on such matters when I taught kids & spend most all of my time one it while teaching teachers. This is awesome. Does anyone know where I could find a version of the video that will play full screen? I couldn’t find the clip anywhere else online. I used the magnify option on the projector and it worked fine. I also tried downloading the video using the “Video Download Helper” Firefox plugin, but the quality is poor when shown full screen. I’m excited about this sequence. So far, I’m giving mind-expanding or self-awareness-augmenting readings or videos as homework every other weekend in my physics classes, et. al. Okay, there’s some cute – even stimulating, things to consume, but I want to learn about effective metacognition pedagogy. Heck, I still need to identify goals. Way cool. Work worth doing. Kudos. * Brain level: Evolutionary basis of belief formation, beliefs trigger affect. Certainty. Body metaphor. * Social level: Social influence. Self-delusion. Reasons for emotional reactions to nonconforming beliefs. * Reflection/discussion: Can individuals make their beliefs more accurate? How? Why would they? * Exericse: Pay attention for a week. Look at belief changes in social situations. Look for metaphors. Be mindful of own beliefs. Write them down. Wow! Hooray for you….teaching kids to think and to think about thinking (and learning). My focus in middle school and older students. Thank you for sharing this portion of your curriculum! While metacognition, nor physics, is my area of study, I do value your teaching style. I think I will use surveys and questionnaires in my future classroom to find out where my students stand academically and where they need improvement. Also, I appreciate your student-centered approach. The best way for students to learn is by experience. Great post! I am a student at The University of South Alabama taking EDM310. I have been assigned to follow your blog and comment on your post. I think it is great that you are getting these young students to think about their thinking process. 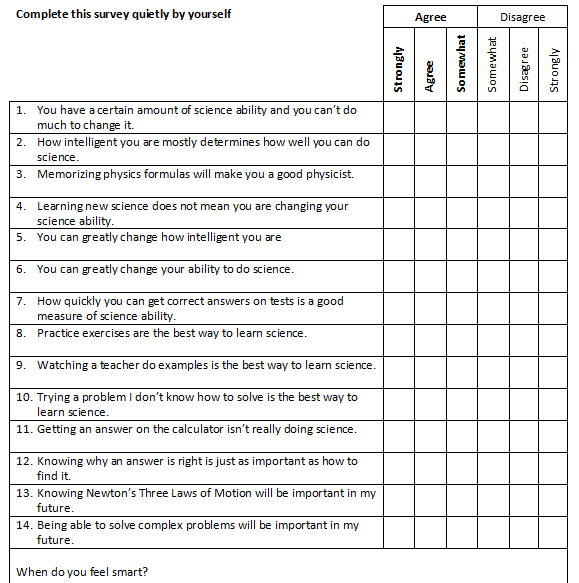 I think that questionnaires are a great tool to learn about your students. I borrowed heavily from your “Scientific Reasoning” learning goals a couple months ago when I was planning the homeschooling work that I have been doing with my little sister and this looks awesome too. Do you have any thoughts on what a good ratio between metacognition work and normal work is? Also, how would one encourage parents to discuss schoolwork with their kids in a way that would promote metacognition? My name is Kaitlyn, and I am a student in EDM 310 at the University of South Alabama. Our class blog can be found here, and my own blog can be found here. This sounds like a really engaging lesson that you put a lot of thought into planning. I think using surveys are a quick and easy way to see where students are in different academic areas. I hope to deliver great lessons like this one when I start teaching. Thank you for sharing your lesson plan with us. Great stuff! I was not able to see the Scientific American Frontiers video clip by following the link, I am in the EU– if that matters. I have looked in as many places as could think of for an alternative posting. Has anyone else had this problem. If yes, has anyone found a solution? I just started really getting into your blog. I’ve always liked your ideas and contributions, but this summer I’d love to get start getting involved and respond to blog posts of other physics teachers. I tried teaching metacognition this year with a survey and sbg, but it kind of petered out as the year progressed. Have you considered putting this in an online survey? I gave my students a survey at the beginning of this year about their learning styles and their self-perceptions. I used googleDocs and found it to be really convenient. I could run stats, look at correlations, etc. Though I didn’t give the survey again, I’d love to calculate how students’ perceptions change as the year progresses, and how that change is correlated to content mastery.